This 3-day course teaches students step-by-step the key techniques for working with InDesign CC (2019 Release). The 15 project-based step-by-step lessons show users the key techniques for working in InDesign. Designers will build a solid foundation of typographic, page layout, and document-construction skills that will enable them to produce a broad range of print and digital publications from a simple postcard to an interactive Adobe PDF with form fields. Our two day course will provide you with the core skills you need to make the most of this extremely powerful application. 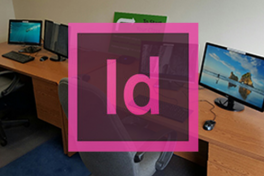 Adobe InDesign software lets you focus on your layout, with the flexibility to publish your pages to a wide range of media. Whether youre creating print or digital documents, you can save time with online services that integrate with and are directly accessible from InDesign, as well as other substantial productivity enhancements. Whether you need to reposition an image within a frame or change the radius of a rounded corner, InDesign helps you work more efficiently. This hands-on introductory course details the most essential Adobe InDesign features for beginner level users. Students will create multi-page documents while learning a variety of text and image layout techniques. Topics Covered: Creating & Customizing Documents Page Setup & Layout Working With Master Pages Working With Typography Applying Color Placing Linked & Embedded Graphics Working With Vector Shapes Working With Styles Transforming Objects Packaging For Archiving Exporting For Print Notes: Students work on their own laptop. Adobe InDesign Essentials Class Overview In this two-day course, you learn to lay out a multi-page document, insert photos, create text styles, master documents and pages, flow in copy from Microsoft Word, and print documents.You'll create hands-on projects including text ads, magazine spreads, postcards, multiple page newsletters, and more. Free Retake: Retake the class for free once within six months (provided the class is running with an available seat). Hands-on Training: Our intermediate Excel class is hands-on and uses real-world examples throughout the training.